Public order has finally triumphed over public space! It’s time to celebrate. No More Public Space, Only Public Order (Water Cannon) is an absurd, mobile sculpture of a water cannon made out of materials used to control the movement of people in urban spaces, such as temporary fencing, safety cones, crowd barriers, warning signs and barrier tape. 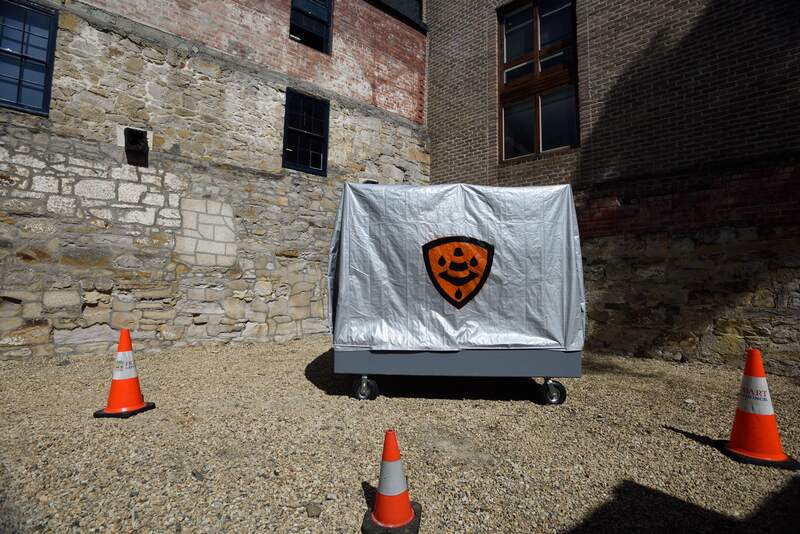 The work will be presented to the public in an exuberant parade around Salamanca Place. Choreographed performers will demonstrate the water cannon’s capabilities in a grand celebration. The cannon will then be exhibited at Kelly’s Garden for a month. At a time when harsh new anti-protest laws are being proposed in jurisdictions throughout Australia, the artists hope to prompt reflection about the regulation and control of the public sphere. Kelly’s Garden Curated Projects is an initiative of The Salamanca Arts Centre and made possible through the generosity of Aspect Design and fundraising from SAC’s Supporters at the SAC Quiz Night.This Project is part of MONA FOMA 2016 and is assisted by the Australian Government through the Australia Council, its arts funding and advisory body, and through Arts Tasmania by the Minister for Tourism and the Arts.and the City of Hobart.